Peoples Health is committed to helping our plan members manage their health and be active. That’s why most of our plans cover a complimentary membership at a network fitness center. Membership includes all of the center’s services, including cardio equipment (for example, treadmills and stationary bikes), weight-training equipment, classes, pools and saunas. Fitness center services that normally have an additional fee, such as personal training or classes that must be paid for individually, are not covered by the complimentary membership. Use our search tool below to find a fitness center in our network. Let us know which fitness center you want to join. Click a name in the results listing, then click the Select This Fitness Center button. When you first visit the fitness center, let the staff know you joined through Peoples Health and show your Peoples Health plan ID card to finalize your membership. When you first visit the fitness center, let the staff know you joined through Peoples Health, and show your Peoples Health plan ID card to finalize your membership. Already have a fitness center membership through your plan and want to change centers? You can change at any time. You may start going to the new center on the first of the month after you notify us. Note: You may join only one fitness center at a time. 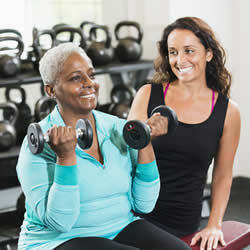 If you change fitness centers, some centers may require advance notice to end your membership. You may want to first contact the center you are leaving to discuss.